Dollhouse Miniatures by Felma J.: Week 14 Zumba! Come Out Of The Closet Celebrate Life And Zumba With Me! Week 14 Zumba! Come Out Of The Closet Celebrate Life And Zumba With Me! Last week I wrote about how "time waits for no one," but I didn't mean you have to rush things. Look at the June Bride in the picture to the left and see how great she looks in her wedding gown. It is never too late to enjoy life! 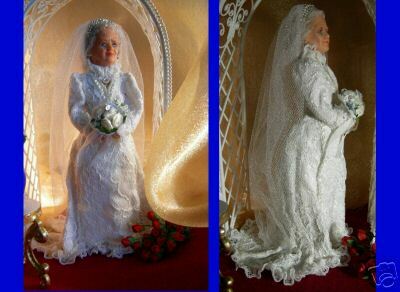 At five inches tall, this doll was a lot of fun to create as an older bride and the wedding gown she is wearing is one of the best I've made! At 62, I am having the time of my life. I ended week 13 with a great accomplishment; I walked seven days straight! Yesterday, starting week 14 was my first Zumba class and afterwards I went to my doctor's office for my usual random blood pressure check and for the very first time in years it was so low I walked out of that office feeling free! Thank You Lord! Today my husband and I went mountain climbing. Tonight as I write this blog my eyes are burning and watery because I just had a massage with Tiger Balm. Zumba is soooo much fun, but my class yesterday was intense and one on one, therefore, I used muscles I didn't know I had and they needed some tender loving care before going back to class tomorrow morning. My hope is that my strength will continue to be renewed as I Celebrate Living. Thank You Lord! Again, thanks to all of you for your encouragement and prayers. Love to All.